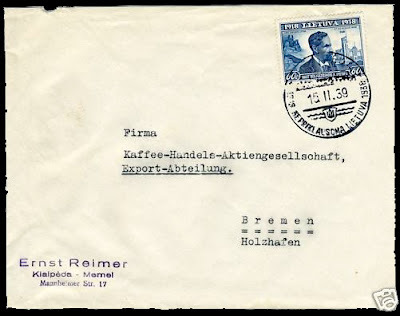 Cover to Germany dated 15 February 1939. International rate of 60 ct. Commemorative cancellation Nepriklausoma Lietuva (independent Lithuania) 1918-1938. With Mikulski expertization certificate. Mikulski expertization mark on reverse of cover.